Thomas once worked Foster Web Marketing as a coder each summer over his high school and college years, but now he returns as a full-time marketer. After working at a local private school and working as a marketing coordinator and graphic designer, Thomas decided he wanted to pursue a marketing career further, so he has come back to join the Foster Web Marketing team. Thomas is Tom Foster’s son, as you might have guessed, and resembles him in many of his aspirations. He enjoys playing guitar, playing video games, and spending time with his friends and large family of seven. Thomas wanted to learn to play the guitar pretty much all his life but didn’t start playing until his sophomore year of college. On the day he got his guitar, he spent the entire day practicing. Thomas also takes his role as older brother very seriously. With a 9-year old sister and 6-year old brother, he tries his best to set a good example for them and to be a part of their lives. Thomas is also an avid Redskins fan, and while he hasn’t seen them win a Super Bowl in his lifetime, he believes in his team! 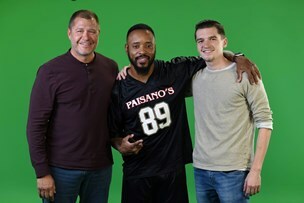 He got the chance to meet his childhood hero, Santana Moss, thanks to Gearshift.tv’s working with so many Redskins players in their commercials. He’s painted a fair amount in his lifetime, and also brings an artistic perspective to the table in everyday life. Feel free to check out some of his artwork. Thomas loves people, and he strives for everyone to be his or her best self and to be happy as possible. Philosophy and psychology are of great interest to him, and it brings him great joy to see them applied to real-life situations.